Last year the character of Tarzan celebrated his 100th year in print. A serialized version of the story first appeared in 1912. A hardcover collection of Tarzan of the Apes first appeared in 1914. Being in the middle of the Tarzan centennial period it’s an opportune time to (re)visit many of the screen renditions of the character. Previous posts in this and other series can be found here. From reading some on the series, not exhaustively mind you, but I have seen mention that Maureen O’Sullivan was known to be playing Jane for the last time in this film, which is understandable. It’s understandable that an actress of her talent would want to move on to something else – in this case to devote time to her actual family offscreen. For as well as she played Jane, and as well as the writers consistently crafted her part, the need for a change can be tolerated. Similarly, the need to change venue from the escarpment can be accepted. It’s almost like airing out a play when adapting it for film. A play tends to be mostly interiors and focused on having a unity of time and space as much as possible dating back to Ancient Greece. Film by its nature needs more room in time and space. However, it’s what done in light of these facts that isn’t all that great, along with some ancillary fumbles that take an idea with potential and makes it a sad miss. Most notably the sequences in New York don’t do great with the fish-out-of-water aspect, and introduce maybe more unfortunate racial attitudes than were ever displayed in the jungle. Even if you’re inclined to let that slide understanding it came with the time, it’s further jarring because, at least when O’Sullivan played her, Jane was a very progressive woman for the era, living in the jungle and all she willingly left behind – so being shown other antiquated attitudes stands out more. Which brings us to one of the few bright spots this film has and it is, oddly enough, the courtroom sequence. 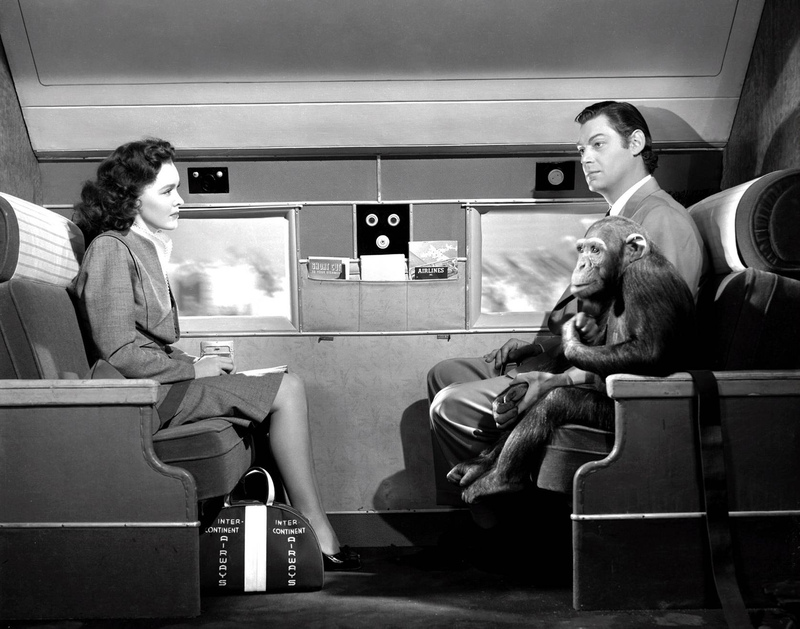 Here both Jane and Tarzan get to speak and stake their claim to boy. It gives O’Sullivan the chance to perhaps display more range with her character than she ever did. Seeing as how in protecting Boy’s interests she makes mistakes and reels from them. Tarzan is allowed a few philosophical insights on the stand and is prodded to the point of rage and attacking the prosecutor. It’s most definitely Weissmuller’s best turn as the character. It also marks another progression as Tarzan is now more vocal than ever in part because he has to be but that has developed well throughout. However, much of the sequences outside the escarpment do nothing great or exciting. As the series grew longer the running times grew shorter, but the task of crafting a good Tarzan film didn’t get easier because it seems in some installments more filler was added rather than substance, and this film is a prime example of that. Now, I have been purposely exploring narrative patterns and some other themes that run through the series without annotating each post with a score simply because I wanted more focus on these areas as opposed to the good or bad. Similar thoughts have come to me when I tackled other series’ in the past. The precise number I’d rate it was almost an afterthought because I wanted to discuss certain things regardless of what side of the good/bad paradigm the film fell. So without bringing it up until we get to that film: there will be another good one and this is not it. The filler, which in this film was a lot of Cheetah alone both on the escarpment and in New York was usually just her. In the plot I only noted one occasion where Cheetah’s involvement was both necessary and helpful. In production she was most helpful as she got the three leads quite a bit of time off while the camera rolled on random monkey crap. The naïveté and messing up of Boy landing him in trouble rears its head again. This a well that was went back to far too often with his character being too slow on the uptake. Many of the films were very concerned with how white men would try and fool or convince Tarzan who rightly grew more skeptical as the films moved on. Boy sadly got to repeat the exact same tropes too many times over. There are rare flashes of growth in his character later on that are a breath of fresh air. To be fair, he is spirited away in the end but it’s his naïveté that gets him into the situation. 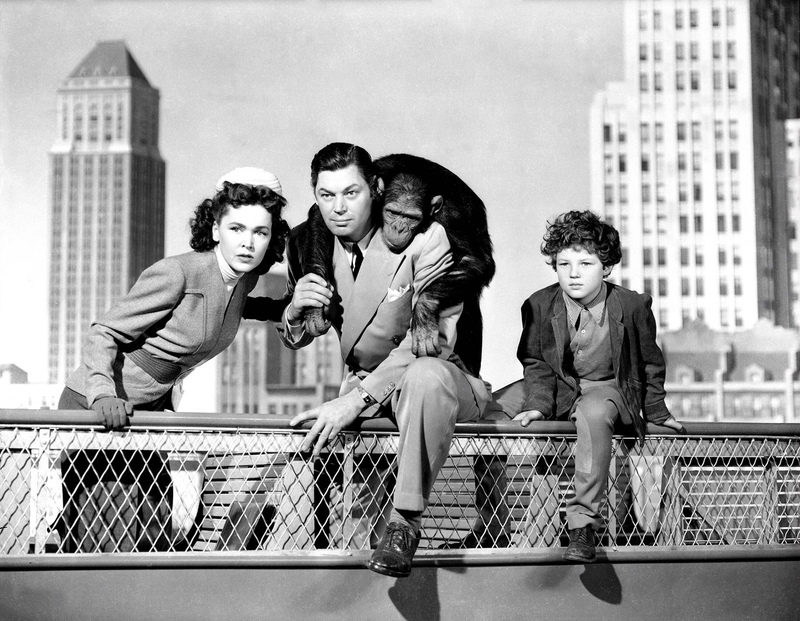 Aside from the courtroom sequence the best aspect of the film is definitely the fact that, despite Tarzan seeming more able to cope with civilization than he should, Jane most definitely take the lead in their search for Boy throughout New York. Essentially what this film hoped was that a few different setpieces while others were re-fenestrated would be enough to make it feel truly different without the film ever getting there. Essentially it started to feel like MGM was really just churning the series out at this point and it ending there was just fine. The films not only got shorter but got less score. I remember at one point when the score came in thinking “Oh, there’s the music.” Music was far more present in the first three. At this point if the series was to continue, which it did, it turning around to RKO was not necessarily a bad thing.